As adults, most of us are familiar with daily aches and pains. Unfortunately, research shows that children are just as likely to experience these problems as we are. Studies show that as many as half of all kids have weekly headaches or back pain.1,2 Some of the most common causes of musculoskeletal pain in children are sports, heavy backpacks, being overweight, scoliosis, and psychological stress. These statistics are troubling, because studies show that pain in childhood and adolescence is likely to lead to chronic pain in adulthood. As parents, our utmost concern is our children's well-being and we all want to make sure that any type of care or treatment we get for our kids is safe and effective. Naturally, it makes sense that parents who are considering taking their child to a chiropractor want to make sure that it is safe, too. To help parents make an informed decision, we're going to provide an overview of the studies and surveys that have been published in the scientific literature on the safety of pediatric chiropractic. This study4 was a survey of 956 European chiropractors from 2012. In this paper, 921 of the chiropractors reported an average of 21.5 children patients each month for a total of 19,821 pediatric patients per month in all of the clinics. In this group of doctors, about 8% of all their patients were under 18. 791 of the chiropractors reported some kind of 557 negative side effect in their pediatric patients. 534 (95.9%) of these were mild symptoms, 23 (4.1%) were moderate, and there were zero severe side effects. The vast majority of adverse reactions reported were simple muscle soreness or stiffness after the adjustment that resolved within a few hours. This was a retrospective study5 of 697 chiropractic patients under age three at a British teaching clinic over a period of three years. These children combined received 5,242 chiropractic adjustments during the study period. Of all the adjustments given to the children, seven parents reported an adverse reaction. This represented one adverse reaction per 100 children, or one reaction for every 749 adjustments. There were no serious negative reactions, and six of the seven negative reactions were increased crying after the adjustment. This paper6 was published in 2015 by a group of Australian researchers. The authors did an exhaustive search of the published medical literature, looking specifically for serious injuries in children after spinal manipulation. After screening over 17,000 articles, the researchers found a total of 12 articles that reported 15 serious adverse effects in children. These instances of serious injuries were all single case reports. Three deaths were reported from manipulation, and none of these spinal adjustments were performed by a chiropractor. One death was caused by a physical therapist, one by a cranio-sacral practitioner, and the third by an unknown party. Of the 12 serious injuries reported, seven were caused by adjustments by chiropractors. The other five by non-chiropractors. The vast majority of the reported injuries were many decades old. The seven serious injuries caused by a chiropractor were from 1959, 1968, 1978, 1983, 1992, 1996, and a single case from 2012. In 10 of the 15 serious injuries, high-velocity, low-amplitude (HVLA) manipulations were administered to the children. In 8 of the 15 children who suffered serious injuries, "it was revealed that before the application of chiropractic or manual therapy, there was present a preexisting but undetected underlying pathology or existing neurological symptoms." From this paper, the authors state that while injuries from spinal adjustments in children are exceedingly rare, it's important for doctors check for underlying issues that might be risky and to use less force on children because of their more delicate anatomy. This is another review article7 that looked at 19 studies that explored the role of chiropractic in treating infants with colic. The papers spanned 26 years, and included seven randomized controlled trials and seven case series. The randomized, controlled studies were the most relevant, as they also provided adverse effects in children who received non-chiropractic care. 1,308 infants received spinal adjustments in the combined studies. 97 infants did not receive adjustments. There were nine non-serious adverse events in the manipulation subjects, for an incidence rate of 7 per 1,000 infants. There were 11 non-serious adverse events in the non-manipulation infants, for a higher rate of 110 per 1,000 infants. "...those who had manual therapy had an 88% reduced risk of having an adverse event compared with those who did not have manual therapy." 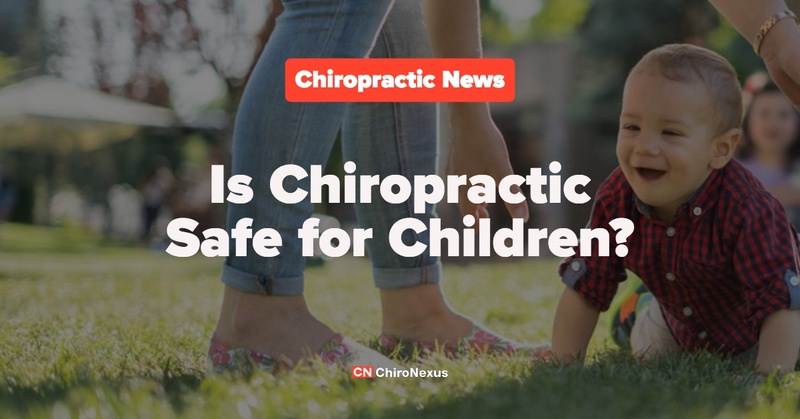 While we could certainly use more research on the safety of chiropractic adjustments in infants and children, the information we have now shows that it's very safe. The vast majority of adverse events from chiropractic are limited to muscle soreness in older children and increase crying in infants. It's estimated that about 1 million chiropractic adjustments are given to patients each day. If 8% of these are given to children, that's about 80,000 adjustments for kids alone each day. Considering that since 1959, there are only 12 serious injuries reported in children from chiropractic care, that's a very, very low rate of injury. Friedrichsdorf SJ, Giordano J, Desai Dakoji K, Warmuth A, Daughtry C, Schulz CA. Chronic Pain in Children and Adolescents: Diagnosis and Treatment of Primary Pain Disorders in Head, Abdomen, Muscles and Joints. von Baeyer CL, ed. Children. 2016;3(4):42. doi:10.3390/children3040042. Noll M, Candotti CT, da Rosa BN, Loss JF. Back pain prevalence and associated factors in children and adolescents: an epidemiological population study. Revista de Saúde Pública. 2016;50:31. doi:10.1590/S1518-8787.2016050006175. Marchand AM. Chiropractic care of children from birth to adolescence and classification of reported conditions: an internet cross-sectional survey of 956 European chiropractors. Journal of Manipulative and Physiological Therapeutics 2012 Jun;35(5):372-80. doi: 10.1016/j.jmpt.2012.04.008. Epub 2012 May 22. PubMed PMID: 22627100. Miller JE, Benfield K. Adverse effects of spinal manipulative therapy in children younger than 3 years: a retrospective study in a chiropractic teaching clinic. Journal of Manipulative and Physiological Therapeutics 2008 Jul-Aug;31(6):419-23. doi: 10.1016/j.jmpt.2008.06.002. PubMed PMID: 18722196. Todd AJ, Carroll MT, Robinson A, Mitchell EK. Adverse Events Due to Chiropractic and Other Manual Therapies for Infants and Children: A Review of the Literature. Journal of Manipulative and Physiological Therapeutics 2015 Nov-Dec;38(9):699-712. doi: 10.1016/j.jmpt.2014.09.008. Carnes D, Plunkett A, Ellwood J, Miles C. Manual therapy for unsettled, distressed and excessively crying infants: a systematic review and meta-analyses. BMJ Open. 2018 Jan 24;8(1):e019040. doi: 10.1136/bmjopen-2017-019040. Review.